Six rainwater tanks are used to collect the runoff water from the PZ building. This water is then used to irrigate the vegetable tunnels and rooftop garden. 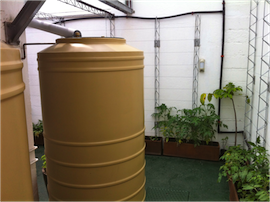 Besides reducing the cost of municipal water, chlorine-free rainwater is used to irrigate the organic vegetables.